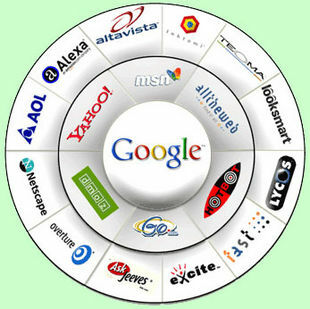 Crawler-based search engines, such as Google (http://www.google.com), create their listings automatically. They “crawl” or “spider” the web, then people search through what they have found. If web pages are changed, crawler-based search engines eventually find these changes, and that can affect how those pages are listed. Page titles, body copy and other elements all play a role. The web server sends the query to the index servers. The content inside the index servers is similar to the index in the back of a book – it tells which pages contain the words that match the query. The query travels to the doc servers, which actually retrieve the stored documents. Snippets are generated to describe each search result. The search results are returned to the user in a fraction of a second. Today, it is extremely common for crawler-type and human-powered results to be combined when conducting a search. Usually, a hybrid search engine will favor one type of listings over another. First asking a new user to describe their interests and hobbies it will then place a one click search button on the tool bar. Using a recommender system, it will return sites that others have reviewed and believe that you will enjoy. It can even be used along side larger search engines such as Google, giving an approved tick for sites that it has specifically matched you with. StumbleUpon’s success can be attributed to its user friendly interface. Clicking a thumbs up or down to show what the user thinks of a particular site is all that needs to be done. If it is a site that has never been reviewed before the user is congratulated on finding the site and given the option to write a full review for other members. Yoono is a social media tool that is more of a add on to the Firefox browser. It sits in your side bar giving you feeds of your friends activities on Twitter and Facebook. With Yoono there is a selection of various widgets that give you different search options. The most useful of these is the ‘Discover’ button which takes you to sites that are similar to the one being viewed at that time. Yoono differs from StumbleUpon with a ’surprise’ button, scanning bookmarks already saved and taking you to a random site that is related. Fichey is perhaps most unique of the social network searches. Taking popular searches from Digg, StumbleUpon and other similar sites it compiles searches and turns the sites into pages that can be ‘flipped’ like a magazine. Another unique feature found on Fichey is that searches can be specified to show site pages published on a particular day. Although these site are still relatively new, they are growing fast in popularity making it prime ground for businesses to get noticed and bring themselves closer to their customers.